Well BBs I've been trying to keep up with all the fashion events this week, but still found myself mostly drawn to more of the New York Fashion Week runway shows showcasing their Fall 2013 collections! I've picked out a few that caught my eye to discuss today! We start with two magnificent Reem Acra gowns. These truly are show pieces. I have no doubt we will be seeing these dresses in magazine editorial spreads, probably shot somewhere just as grand - like Versailles Palace ;) Every detail, stitch, and hem feels regal to these gowns, and I am simply in awe of them. 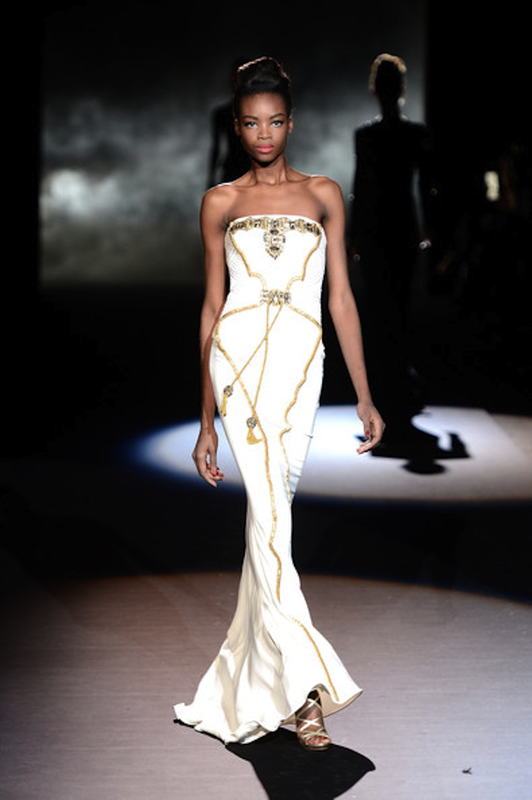 The next two pieces are by Badgley Mischka, and I love the use of gold in both of them. The first piece pretty much looks like 'if an Academy Award was in the form of a dress' it would be this, lol! The detailing of the gold beading, is amazing in an almost art-deco-like pattern ending in a tulle mermaid tail. Stunning. The second piece feels more Roman with its tassles and gold stitching against the white. I can see both gowns being worn for red carpet events in the future. I hope you all enjoyed these pieces as well, have a lovely rest of the week kittens, and I'll see you all on Friday!